I've been obsessed with watching the show "Who Do You Think You Are" on Friday nights (yes I realize I need to get out more) recently. The show got me thinking about my own ancestry, and also the roots of my married name as well. Now, you all know about Einstein - you know, the little 4 lb furry monster which frequently appears on this blog? Anyways, imagine my surprise when I find that the surname Madigan means "little dog" (which makes me think of Einstein, who is indeed a very little dog) and is of course, Irish. 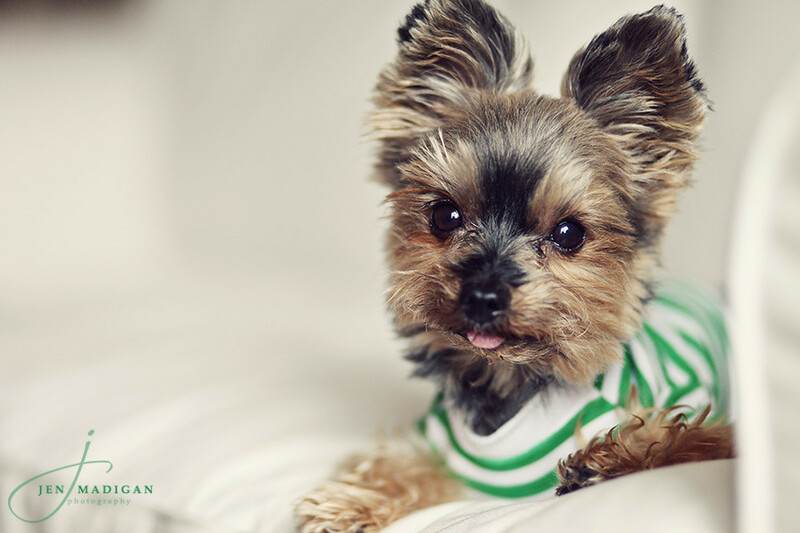 So, with today being St. Patrick's Day - I thought it very appropriate to celebrate my Irish surname with a photo of (you guessed it...) a little dog in a green and white shirt. I think he'd make a great St. Patrick's Day mascot, don't you? Hope you all have a fun and safe St. Patrick's Day! !